More enticing than fruit and more exciting than flowers, fine chocolates are gathered together to create a delicious bouquet, perfect for celebrating any special occasion. 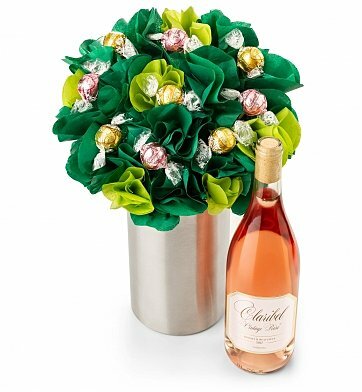 Our stainless Champagne chiller is overflowing with a "bouquet" of luscious chocolate truffles, served with a companion bottle of Claribel California Vintage Rosé Wine. One BonBon Blooms™ Radiant Rosé Bouquet. 750 ml Claribel Vintage Rosé Wine. What are the chocolates inside this bouquet? Each gourmet item is carefully assembled by hand, and the bouquet is securely packed to provide safe transportation. A complimentary card with your personal message or greeting is included with this gift. BonBon Blooms™ Radiant Rosé Bouquet is a hand delivered gift. These gifts are delivered by one of our local design centers located throughout the United States and Canada. Same day delivery is available for most gifts when ordered before the cutoff time. The cutoff time for BonBon Blooms™ Radiant Rosé Bouquet is in the recipient's time zone. Claribel Vintage Estates Bright & Beautiful RoseFresh, dry and bright with crisp acidity, Clairbel's Bright & Beautiful Rose has a bouquet of strawberries, white flowers, stone fruits and a hint of minerality. This gift was for my daughters %u201C21st%u201D birthday! It was perfect, she loved it. I would recommend this gift when you just want something thoughtful and simple.